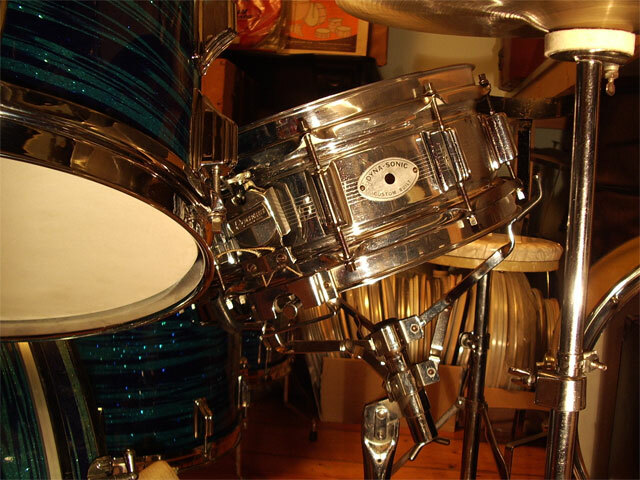 In the sixties USA Rogers were the Cadillacs of the drums, with modern SwivoMatic hardware and perfect shells and hoops compared with Slingerland and Ludwig. They were the most expensive too, import taxes made them excessively expensive in Europe and in the early sixties the English Ajax factory agreed with Rogers to build a UK Rogers, they didn't tell you then but we know now. 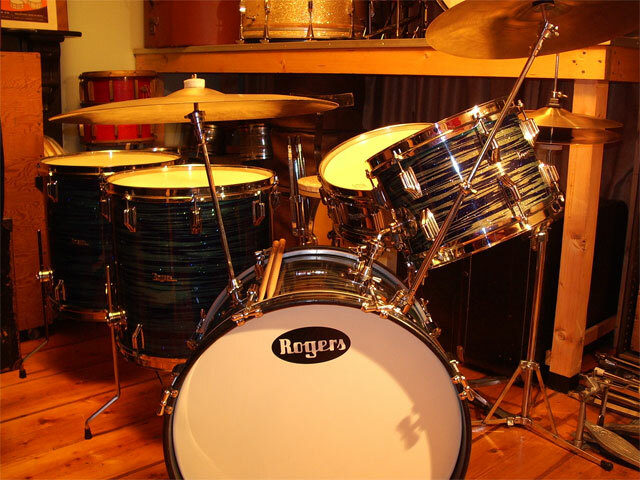 This set is a fine example of an 1964 UK Rogers set with nice lacquered Ajax shells covered in a real wild blue stripes glitter, all original, but I've never seen it in a UK Rogers catalog. If you have, let me know. Rare set up with the 2 FTs. Some fading from one side. 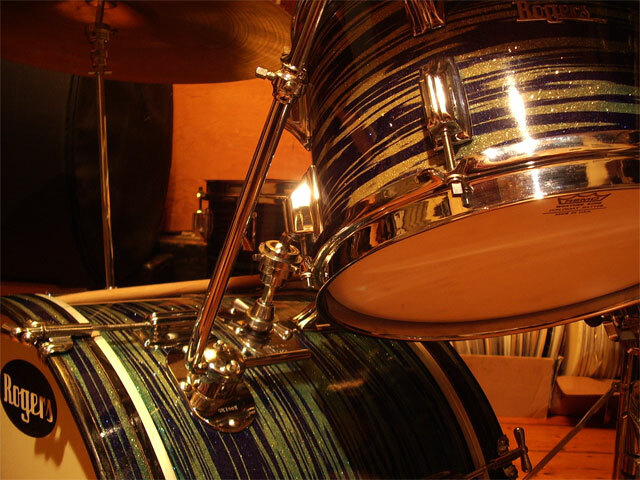 The toms sound full and fat with lots of sustain and that warm thin-shelled big vintage sound. 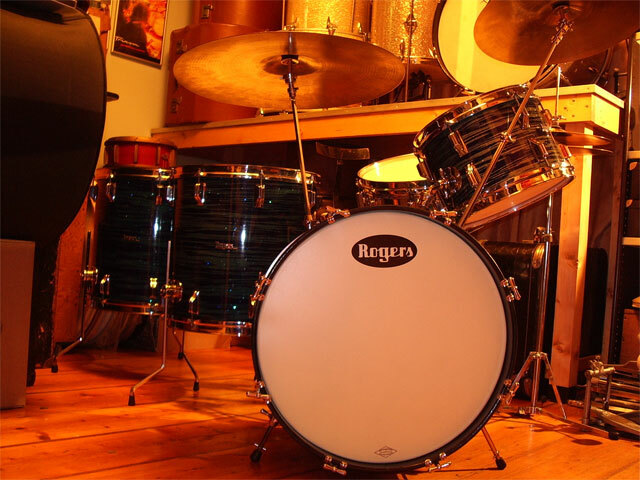 Included is the heavy 5.5 x 14 Dyna-Sonic UK Rogers brass shell snare that sounds absolutely great, from whisper to roar! 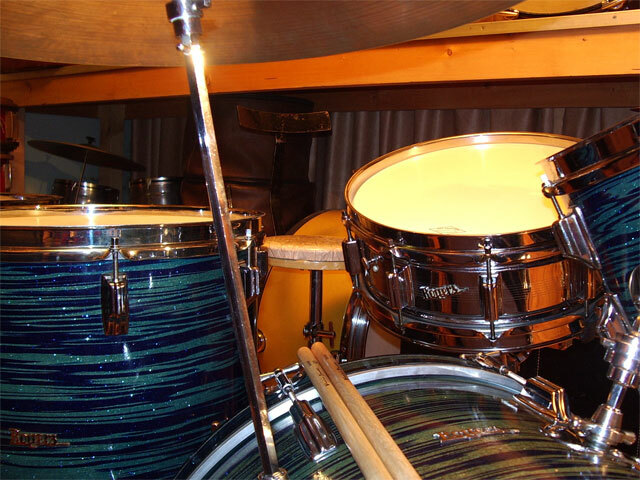 Complete with all hardware to set up the drums, 2 cymbal arms that mount to the bassdrum, tomholder, spurs, floor tomlegs etc complete and all original, included is a perfect Swivomatic bassdrum pedal and a swan-leg Swivomatic hihat stand (not pictured).